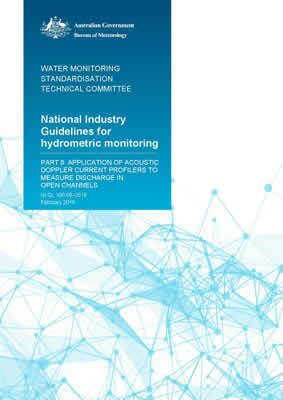 consistent across water monitoring organisations operating under these guidelines. This is the minimum guideline that shall be followed to allow the collected data to withstand independent validation and data integrity checks. Additional field procedures may vary between organisations and States. This document deals with the use of boat-mounted or mobile acoustic Doppler current profilers (ADCPs) for determining streamflow in open channels. It specifies the required procedures and methods for collecting data by Australian operators. It specifies procedures for the collection and processing of surface water data collected by ADCPs. The document does not include or rewrite instrument manufacturers’ operating instructions for their individual instruments. Nor does it detail Standard Operating Procedures (SOPs) of organisations using these instruments. However, it is expected that those SOPs are sufficiently robust to withstand independent scrutiny.